I decided to branch out beyond my nonfiction audiobook niche by listening to Citizen: An American Lyric by Claudia Rankine, which is a short book of prose poems about different aspects of racism in the U.S. I thought that a lot of Rankine’s writing was extremely powerful and there were several lines that gave me chills, but it seemed like some passages were just so much stronger than others. I also found audiobook a difficult format for poetry; I was constantly rewinding to make sure I was fully appreciating the words. I also finally allowed myself to finish A Court of Mist and Fury, after savoring it for about a month. This series is so romantic and dramatic; it was a fantastic sequel that definitely surpassed the first book. Recommended for fans of romantic fantasy. The Color of Magic was a disappointment for me. I’ve read two other Discworld books (Mort and Small Gods) that I enjoyed, but this one unfortunately got really…boring. It started out well, with humor and an interesting setup, but then went rapidly downhill. I know that this is the first book in the series and isn’t widely considered one of the best, but I was still disappointed–particularly with the book’s treatment of female characters. I understand that Pratchett was satirizing a lot of aspects of fantasy literature, but it’s still really unnecessary, and in my opinion a turnoff to a lot of female readers, to have literally every female character be naked in this book. I’m about 1/4 of the way through Those Who Leave and Those Who Stay (the third book in Elena Ferrante’s Neapolitan Novels), which so far is surpassing the previous book in intrigue. We’re getting more and more hints toward the future of the relationship between Elena and Lila, and things are happening really quickly. Also, in a not-so-shocking turn of events, I ordered the fourth book, The Story of the Lost Child, on B&N.com. Also! I am 100% on board with The Raven Boys. I complain a lot about my pickiness with YA, but this book is hitting all the right notes for me. I purposefully didn’t read anything about the plot or characters before starting it (I picked it up entirely on recommendations from bloggers and bookstagrammers) and I think that was a really good decision. I love all of the characters, the setting, and the fantasy elements. It’s really unlike any other YA I’ve read before. I’m about 1/3 of the way through and already putting the second book on hold at my library. And for audio, I picked up The Cuckoo’s Calling again after abandoning it about 2/3 of the way through this winter. I wasn’t in the right mood for it before, but I’m enjoying it more now, particularly as the plot is finally starting to pick up. Finally. I’m definitely going to finish it this time, but I doubt I’ll read the rest of this series. As far as print books go, I can see myself jumping right into the next books in the Raven Cycle and Neapolitan Novels next. It’s so weird–I feel like I NEVER read already completed series, and it’s such a nice feeling not to have to wait until the next book is released. Not that this will ever stop me from reading unfinished series, but it is quite nice. 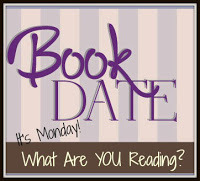 What are you all reading this Monday? Feel free to link to your posts! I’m super-picky about YA but lately I’ve been thinking about picking up “The Raven Boys” after seeing it so many times. I’m glad you’re enjoying it! I’ve also seen the Elena Ferrante series a billion times but I’m always on the fence about it. I’m intrigued, but not enough to commit to it. And those covers always turn me off! I want to talk to whoever does the marketing/cover art for Elena Ferrante’s books, because I think they are costing her a lot of readers! Trust me–ignore the covers because the books are so well-written. As a picky YA reader myself, I’d say you should give The Raven Boys a shot 🙂 Although I tend to hate a lot of YA series that most people love, so you never know! I think going for poetry on an audiobook as someone who has a hard time listening to audiobooks in general was too big of a step for me haha, although I thought some segments of Citizen were really amazing. So far, Men We Reaped is excellent–I’m listening to the audiobook and I also really like the narrator. I also just realized that I recently bought Jesmyn Ward’s other book, Salvage the Bones, at a used book sale–I need to get to that one too! Does she have another new one coming out? Yes in August, but it’s one she edited I believe with various contributors 🙂 It’s called The Fire this Time and is nonfiction essays.